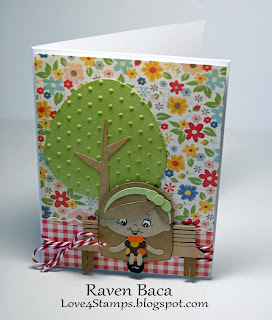 This was a super cute file to work with and create a Fall type card for friends or family member. The cut file consists of the Hay stack and title. The pumpkin from a file from Creative Kuts. 3-Piece button layered and tied with twine and glue dot to the corner. 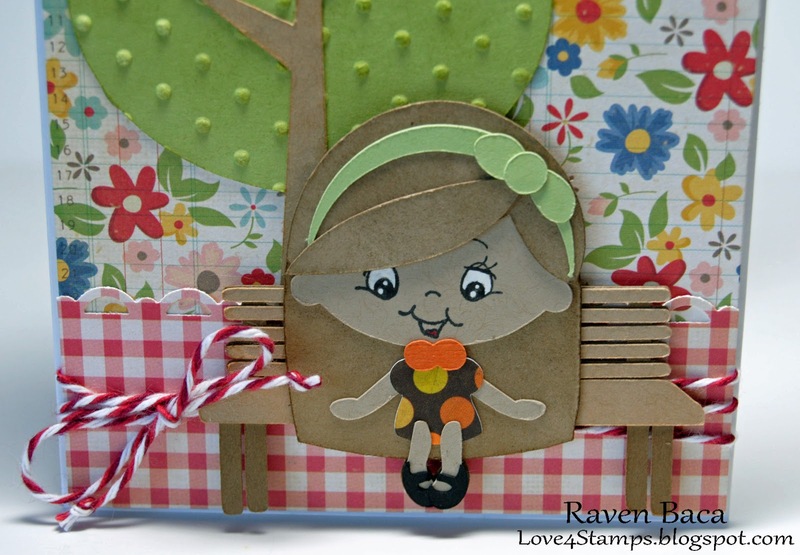 I cut two strips of green card stock and added to the card ... hoping it looks like a fence post. The black and white polka dot washi tape from Wal-mart. Thank you for stopping by to visit with me today, Happy Halloween to you all and hugs to all. Happy Tuesday! Candace here today!! Here is my card. I used Bushel of Memories, love her!!! Isnt she the cutest? I also used Silhouette Store to create this shape card that she is on. "For you" is from Jaded Blossoms "Simple Sayings"
I also used Twine from the Twinery and chalk. Thanks so much for checking out my project today!! 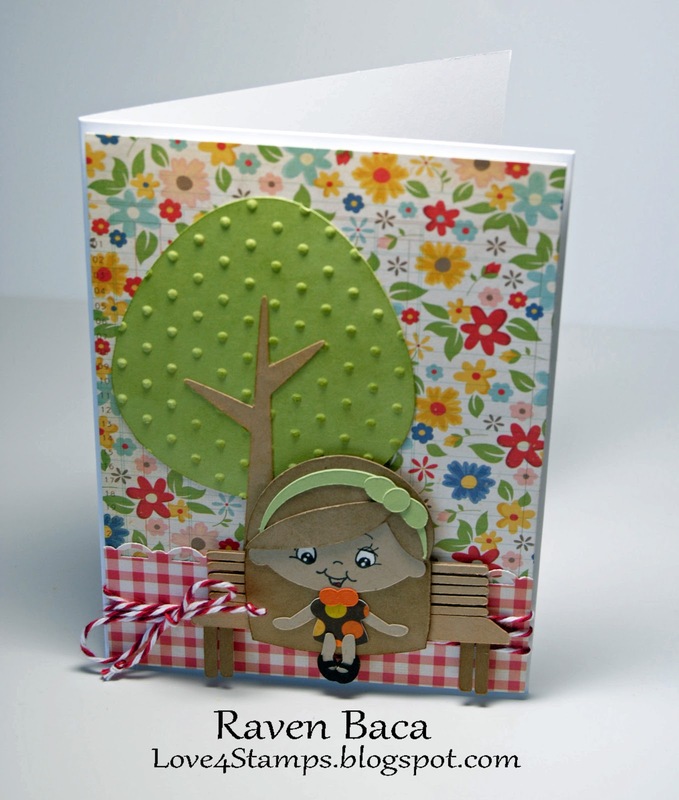 Winner of Pumpkin Patch Cuties Giveaway & a new giveaway!!! First and foremost, thanks to all the new followers that have joined us. We are thrilled to have you here and hope you will continue to check in Tuesday through Friday each week to see all the wonderful things our DT has been creating! CONGRATS girls! 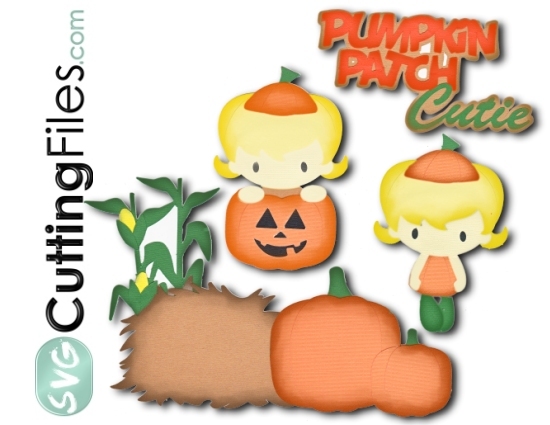 Please email me at sales @ svgcuttingfiles.com to with your email address so I can send out Pumpkin Patch Cuties to you! This week, we will do ANOTHER giveaway... in honor of our upcoming releases! Can you all believe how amazing the DT projects are this week!!! ;) WOW seriously. All I have for you on this beautiful Friday is a card. I whipped this up in my Silhouette design studio and cut her out. She cuts so beautifully. For more info visit my blog. Thank you all so much for stopping by! Can't wait to see what you create with this cutie pie file. The kit I used today is the Piles of Leaves set. I knew for this file I wanted to make a Shadow Box Card. This is my first. I wanted the leaves to look as if she were really jumping up and down. I love how it turned out. What say you? Good morning...this is my second DT project for http://www.svgcuttingfiles.blogspot.com and the cutting file is one of a couple pilgrims...the female pilgrim. I first laid out the white cardstock in the size I wanted, and typed in the sentiment in lower right hand corner of the card. The second layer cardstock is a image or clip art on found on a Internet search, saved the image and than brought up into my Abode Photoshop Elemets software and printed it out in the size that could be cut down to fit the card base. I cut out the Lady Pilgrim and placed on the card along with two sizes of pumpkins. The eyes I added lashes and white in the eye area to give it some dimension. Have you been inspired by the work here. If so, join us and start FOLLOWING our blog! Leave us a comment anytime this week and we will enter you to win our adorable Pumpkin Patch Cutie themed set! Announcement of winner of this cute set will be made on Monday, October 29, 2012. Thank you for stopping by to visit, and hugs to all. Hi everyone! Candace here.. Happy Tuesday! Here is my project for today... I am in LOVE with this pumpkin pie card! 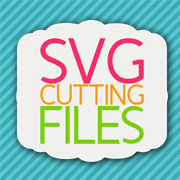 This pumpkin pie SVG is called "Sweet Thing" and it is from SVG Cutting Files. The paper is My Minds Eye "Darling Dear". 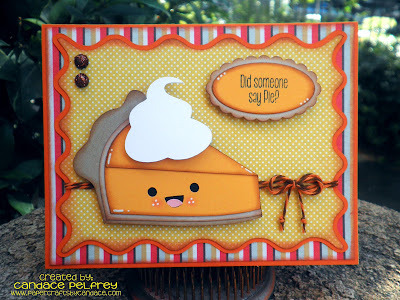 The sentiment "Did Someone Say Pie" Is from Jaded Blossom's "Turkey Poop"
Twine: Trendy Twine "Orange Truffle"
Thanks so much for checking out my card today!! Fall is so IN THE AIR & you can WIN a free set! I am so thrilled with everything the DT did last week for the blog....and well, to be honest, what they have to inspire you THIS week is even BETTER! Make sure you come by EVERYDAY this week (Tuesday-Friday) to see what they have to offer. From pumpkin pie slices, to falling leaves, we have it all covered. The girls are TRULY talented and I am loving what they create, don't you? Have they inspired you so far? On the glass jar gift I ended up making a card out of the same hat that Sabrina is wearing. 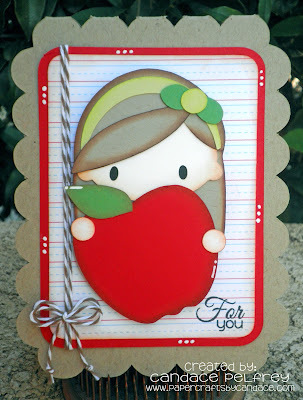 ;) I also used a really cute face stamp from Peachy Keen Stamps as well as a sentiment. More details and pictures on my blog. Thanks so much for visiting today. Today is my first day posting here as a DT member. 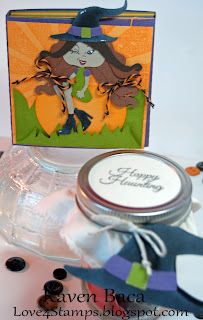 The kit I used today is the Pumpkin Patch Cutie set. 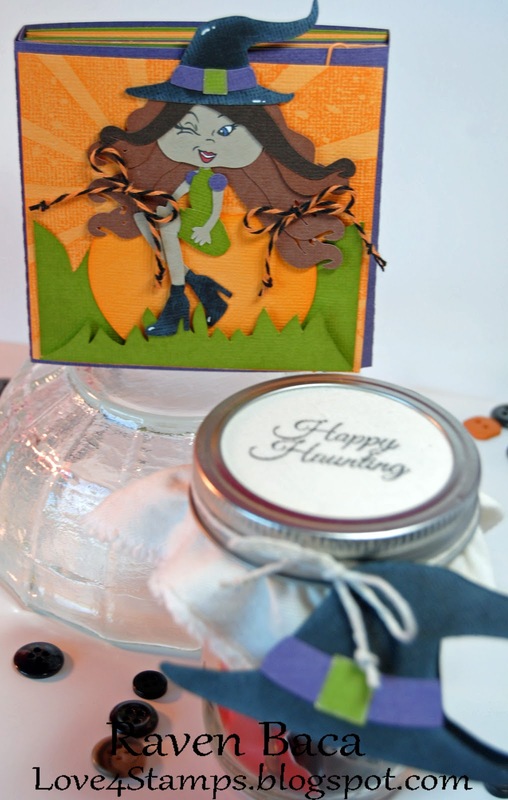 This little pumpkin was a perfect file for a a Shaped card. I really like how it turned out. Not only was this image perfect for a shaped card it was for this next card as well. 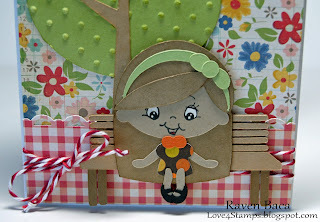 Gigi from The Cricut Bug, made this card and then a few days later wrote a tutorial. Thank you Gigi. The moment you posted your card I knew I had this image and that it would be perfect. The ghosts files from ... I don't remember where I obtained them...a free file from a blog I follow. I created a center step card, cut the Spooky Haunted House file and centered it..over a circle I created in my SCAL software. I placed design paper on the edges layered over card stock, and layered orange card stock on the step. I love this file....and will be using more and more. I added the bat onto the moon, and a cat just over the end of the word Haunted with foam tape. The ghosts I foam taped to the edges of the spooky house. Thank you for visiting with us today, and hugs to all. Happy Tuesday!! Candace here again, and I have another card to share with you today! For todays card I used the Zombie Wedding file. 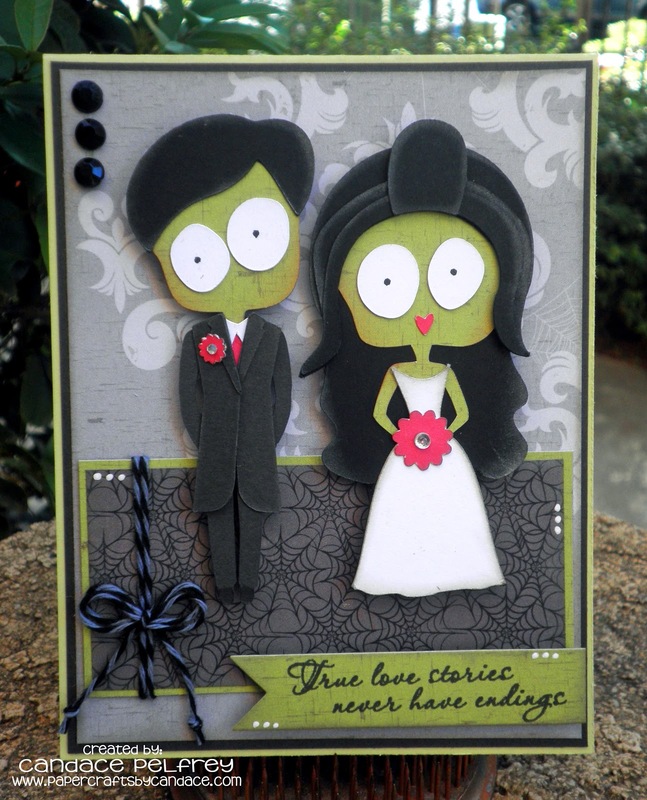 When I saw this Zombie Bride and Groom I knew exactly what sentiment I wanted to use! The sentiment "True love stories never have endings" is from Jaded Blossom's "Wedding Wishes" I also used the small flag dies from Flag Dies 2. Happy Monday!! 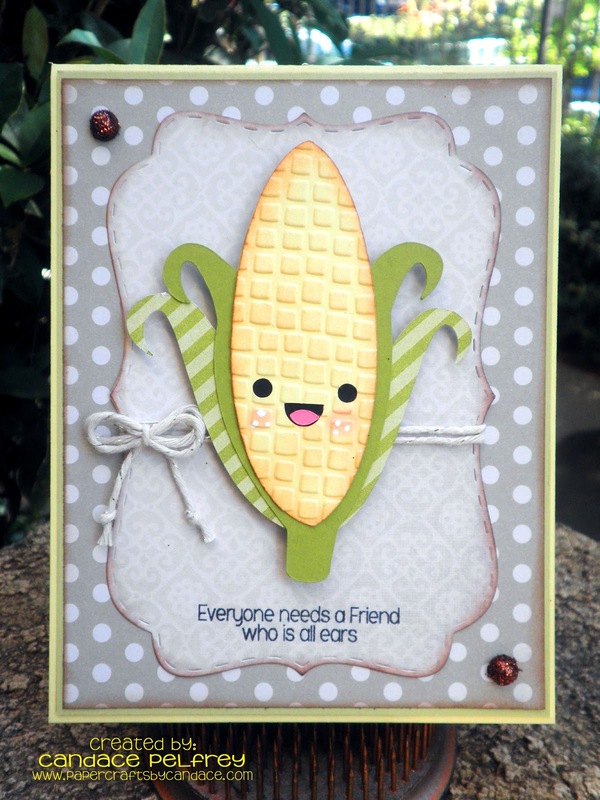 Candace here, and I am soooo excited to share with you todays card and my first post as a SVG Cutting Files designer!! I just LOVE all these cute SVG's and you will too. I used the "I'm All Ears" file for my card today. Soo cute!! I LOVE how my corn turned out! I embossed him using the Tiny Mosaic embossing folder. In the background is the new Fancy Topper die from Jaded Blossom which I inked the edge. The sentiment is from Easter Owl. Additional details on my blog. Make sure to come back tomorrow because I have ANOTHER card for you!! Yay! Making it happen, slowly but surely! Today was quite productive...tested about 10 new files...and getting them ready to share with the DT so they can start creating....will be working on more tomorrow and Wednesday....so excited! Many of our Winter images from our sister site, Digi My World is also in the process of being converted...yeah! Welcome to our new blog.... and its a work in progress that is for sure! I just wanted to say Congrats to the girls that made our Design Team. I am so very looking forward to working with every one of you! Thanks for stopping by, make sure to FOLLOW us so you dont miss a beat! 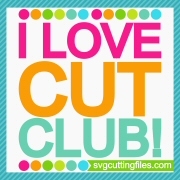 Follow Ann Kelly's board SVG Cutting Files on Pinterest.